This is one of worst hoaxes played on Christians. It is a deliberate mistranslation from the Greek. The words in the Greek translated Hell are Sheol and Hades. Strong’s Analytical Concordance of the Bible provides the correct definition of these terms. “The English word, from a Teutonic root meaning “to hide” or “cover,” had originally the significance of the world of the dead generally, and in this sense is used by Chaucer, Spenser, etc., and in the Creed (“He descended into hell”); compare the English Revised Version Preface. “1. The Word in the King James Version: Now the word has come to mean almost exclusively the place of punishment of the lost or finally impenitent; the place of torment of the wicked. In the King James Version of the Scriptures, it is the rendering adopted in many places in the Old Testament for the Hebrew word she’ol (in 31 out of 65 occurrences of that word it is so translated), and in all places, save one (1 Cor 15:55) in the New Testament, for the Greek word Hades (this word occurs 11 times; in 10 of these it is translated “hell”; 1 Cor 15:55 reads “grave,” with “hell” in the margin). In these cases the word has its older general meaning, though in Luke 16:23 (parable of Rich Man and Lazarus) it is specially connected with a place of “torment,” in contrast with the “Abraham’s bosom” to which Lazarus is taken (verse 22). The true meaning of the two words mistranslated as hell is a “hidden place.” For whatever reason, when the King James Version of the Bible was translated from the Greek, the meaning was completely changed. “23 And in hell he lift up his eyes, being in torments, and seeth Abraham afar off, and Lazarus in his bosom. “24 And he cried and said, Father Abraham, have mercy on me, and send Lazarus , that he may dip the tip of his finger in water, and cool my tongue; for I am tormented in this flame… 26 And beside all this, between us and you there is a great gulf fixed: so that they which would pass from hence to you cannot; neither can they pass to us, that would come from thence.” (Luke 16) The idea of a lake of fire and brimstone is false. Fire would have no effect on spirits. During Jesus crucifixion, He told the thief next to Him: “43 And Jesus said unto him, Verily I say unto thee, To day shalt thou be with me in paradise.” (Luke 23) During the three days His mortal body lay in the grave, He went in the spirit to the spirits in prison—hell. Did Jesus go to “the nether realm of the devil and the demons in which condemned people suffer everlasting punishment.” No! It was not hell as the Bible would currently have us believe. Every person that lives on earth must be provided an opportunity to obey the gospel. Otherwise, God would not be just God. A person cannot be condemned for something he didn’t do. Billions have never heard the gospel of Christ. Jesus mission was to the House of Israel. He told the apostles: “5 These twelve Jesus sent forth, and commanded them, saying, Go not into the way of the Gentiles, and into any city of the Samaritans enter ye not: 6 But go rather to the lost sheep of the house of Israel.” (Matt. 10) The gospel was not taken to the gentiles until after the death of Christ. The gospel was taken to the gentiles on the Day of Pentecost. “37 Now when they heard this, they were pricked in their heart, and said unto Peter and to the rest of the apostles, Men and brethren, what shall we do? 38 Then Peter said unto them, REPENT, and BE BAPTIZED be baptized every one of you in the name of Jesus Christ for the remission of sins, and ye shall receive the gift of the HOLY GHOST. 39 For the promise is unto you, and to your children, and to all that are afar off, even AS MANY AS THE LORD OUR GOD SHALL CALL.” (Acts 2) Peter preached the same gospel as Jesus, Adam, Joseph Smith, James J. Strang, and other prophets of God. Consider the billions of people that have never had the opportunity to hear the gospel. Are they to be sent to “the nether realm of the devil and the demons in which condemned people suffer everlasting punishment.” The foundation creed of the Catholic church teaches this false doctrine. “Whosoever will be saved, before all things it is necessary that he hold the Catholic faith. Which faith, except every one do keep whole and undefiled, without doubt he shall perish everlastingly.” Why the translators of the Kingdom James Edition elected change the meaning of scripture into a doctrine of the Devil is not currently revealed. ALL MEN MUST BE GIVEN AN OPPORTUNITY TO HEAR THE GOSPEL. This is why Jesus went to the spirits in prison and opened a gospel dispensation to them. The gospel is the gate into the Kingdom of Heaven. It requires that a person repent of the evil in their lives, be washed of their sins, be confirmed into the kingdom, and receive the Holy Ghost as a guide into all truth. “5 Jesus answered, Verily, verily, I say unto thee, Except a man be born of water and of the Spirit, he cannot enter into the kingdom of God.” (John 3) Jesus in our example. “6 He that saith he abideth in him ought himself also so to walk, even as he walked.” (1 John 2) Not even Jesus was exempt from this law. What about those that do not even hear the gospel in mortal life? BAPTISM FOR THE DEAD is an ordinance of the gospel whereby spirits can be born of water by proxy. “29 Else what shall they do which are baptized for the dead, if the dead rise not at all? why are they then baptized for the dead?” (1 Cor. 15) Baptism for the dead was practiced after Jesus opened a dispensation of the gospel to the spirits in prison. After Jesus, any time there is a prophet on the earth to communicate with the dead, baptism for the dead is an extremely important ordinance. Peter, James, and John successively held the office of Prophet. After the last prophet—John–baptism for the dead could no longer be administered. Any church claiming to be the Church of Christ must have a prophet standing at its head; and administer this saving ordinance for the those who did not accept the gospel of Christ in the flesh. When the office of prophet is lost, the Church of Christ ceases to exist on the earth. The Kingdom of God remains as long as there is one officer of the Melchisedec priesthood remaining. This doctrine directly opposes the law of God. The doctrine of salvation of the dead and baptism for the dead was completely lost; as all authority from God was lost. Only the doctrines of man remained. The gospel dispensation to the gentiles officially ended in 570 A.D. Now add the 1,260 years. Joseph Smith organized the Church of Christ on April 6, 1830, in accordance with the law of man and of God. Freedom of religion was a recent opportunity. Direct communication with God was restored. The ordinance of Baptism for the Dead was again instituted. When the saints failed to live by the laws of God, Joseph was taken on June 27, 1844. He had received four revelations that in the event of his impending death that he would appoint his successor in the Prophetic Office. This is did–about ten days before his martyrdom. This Letter of Appointment is in Yale University Library. Joseph received a vision from God, was advised of his impending death, and commanded to appoint James J. Strang as his successor. The same hour that Joseph was murdered, James—although 400 miles away—claimed to have been ordained under the hands of angels in accordance with the law of God. The ordnance of Baptism for the Dead was restored by revelation from God. The greatest work that James may have accomplished during his ministry was translation of the Book of the Law of the Lord; which was among the plates previously recovered by Joseph. The prophet James noted in the Book of the Law concerning BAPTISM FOR THE DEAD. “1. To millions of mankind the gospel was never preached in life. If it is not to be preached to them in another state of being, then the salvation which the gospel promises is not offered to them. And if the gospel is not preached to them at any time, then they are denied the possibility of entering into life. 2. Many Christians, unwilling to admit that salvation was not offered to all men, have asserted that those to whom the gospel was not preached were saved, on the general ground that as they did not know the Law of God, they were not under condemnation for breaking it. 3. Admitting this to be true, the consequence would be that ignorance of the gospel was as pleasing to God as obedience; and the just conclusion would be, that the gospel was not revealed to save men, but as an excuse for damning them. For, if all who are ignorant of the gospel are to be saved, universal ignorance would have produced universal bliss. 4. If they fall back on the old Christian faith of the Fathers, that there is no salvation without obedience to the gospel, then without preaching to and baptism for the dead, those to whom the gospel was never preached may justly claim that they were lost; not because they would not obey, but because they could not hear. 5. If, to avoid both horns of this dilemma, the Christian shall say that the sincere and wellmeaning of every nation will be saved, whatever his religious faith, then they are not saved by the gospel, but by their own righteousness; not by obedience to the word of God, but by integrity to the institutions of their several countries and nations. 8. The dispensation being opened, and he having, by a stainless life, and a sacrifice of himself for the salvation of others, become worthy of the keys of the resurrection and everlasting life, ascended to heaven, received all power, and sat down at the right hand of God. The thought of an opportunity to obey the gospel of Christ ending with mortal death should be repudiating to any honest searcher of truth. When the saints again failed under James to live by the laws of God, he was taken on July 9, 1856. This ended baptism for the dead. This ordinance will return when the Kingdom of God is again established before the return of Jesus. “5 Behold, I will send you Elijah the prophet before the coming of the great and dreadful day of the LORD: 6 And he shall turn the heart of the fathers to the children, and the heart of the children to their fathers, lest I come and smite the earth with a curse.” (Mal. 4) What would better to turn the “heart of the fathers to the children, and the heart of the children to their fathers” than baptism for the dead? With the billions of people yet to hear the gospel in the spirit, one can imagine the work that will be required to baptize those who obey the gospel in the spirit. Through the sacrifice of Jesus, all will inherit an immortal physical body. “10 For therefore we both labour and suffer reproach, because we trust in the living God, who is the SAVIOUR OF ALL MEN, specially of those that believe.” (1 Tim. 4) Only those who obey the gospel will enter the Kingdom of God and enjoy the greatest blessings in eternity. WHY HAS ONLY A FEW ENTERED THE KINGDOM OF GOD IN MORTAL LIFE? After Jesus crucifixion, only 120 saints of God were to be found. “15 And in those days Peter stood up in the midst of the disciples, and said, (the number of names together were about an hundred and twenty,).” (Acts 1) The gentiles soon apostatized and only a very few entered the Kingdom of God. All opportunity to enter the Kingdom of God was lost for 1,260 years. Joseph Smith restored divine authority and the gospel of Christ. After his death, it was continued through James J. Strang. Again, very few have entered the Kingdom of God. There are over a hundred groups that claim to be Latter Day Saints. We have seen that when there are two different doctrines they can both be wrong; but only one can be true. After the death of Joseph Smith, Brigham Young claimed there would never be another prophet to stand at the head. Then on Dec. 24, 1847, over two years after the death of Joseph, Brigham admitted the claim of James J. Strang that the Church of Christ cannot exist without a prophet was true. Since God had not called him, he took a vote of the people; and became their man-made prophet. All apostate LDS churches can be identified by one thing: they turn to their own will and teach for doctrine their own opinions. There were the same in the days of Jesus. “6 He answered and said unto them, Well hath Esaias prophesied of you hypocrites, as it is written, This people honoureth me with their lips, but their heart is far from me. 7 Howbeit in vain do they worship me, teaching for doctrines the commandments of men.” (Jesus, Mark 7) One LDS Strangite group reorganized their church into a church of the U.S. Government and made the law of man the law of their church. A true church will only teach those things given in the law of God and the testimony of his holy prophets. Only a very small remnant of saints in Zion have remained true to the law of God. The first estate of man was spiritual. Satan rebelled and thought to stand at the head of this creation in place of Jesus. Imagine, rebelling in the face of God. A third of the host of heaven followed him and all were cast down never to have physical bodies. It is evident that during this rebellion only a few were loyal to God and Jesus. Most like they simply sat of the fence—as they do in mortal life. Only those who were loyal to God and Jesus during this rebellion are called of God to enter the kingdom during mortal life. “4 According as he hath chosen us in him BEFORE THE FOUNDATION OF THE WORLD, that we should be holy and without blame before him in love: 5 Having predestinated [for-ordination] us unto the adoption of children by Jesus Christ to himself, according to the good pleasure of his will.” (Eph. 1) Satan wanted man to be predestined and not given a free moral agency. Predestination is a doctrine of Satan. In order for man to be held accountable, he must have a free moral agency. It would take a stretch of imagination to believe none of those left with the spirits in prison could be saved through baptism for the dead during the thousand years that followed. John said the “rest of the dead lived not” for the thousand years. Those that accept the gospel in the spirit are no longer spiritually dead. Considering the billions that must be given an opportunity to accept the gospel, the work of the gospel must continue through the thousand years when all those who prefer to obey the gospel—the dead—are resurrected. Jesus said: “2 In my Father’s house are many mansions: if it were not so, I would have told you. I go to prepare a place for you. 3 And if I go and prepare a place for you, I will come again, and receive you unto myself; that where I am, there ye may be also.” (John 14) Man will be resurrected into one of these mansions. “40 There are also CELESTIAL bodies, and bodies TERRESTRIAL: but the glory of the celestial is one, and the glory of the terrestrial is another. 41 There is one glory of the sun, and another glory of the moon, and another glory of the stars [TELESTIAL]: for one star differeth from another star in glory. 42 So also is the resurrection of the dead. It is sown in corruption; it is raised in incorruption:” (1 Cor. 15) Before being able to make a proper judgment, man must know both the blessings and the punishment involved with the gospel. Those saints of God that rebel against God by living according to their opinions in defiance of the laws of God are in danger of inheriting this lowest of glory, or worse. “Opinions, where we have the word of the Lord, are worth nothing. Since the days of the Savior, they have strangely divided men into almost as many sects, as the number of the name of the beast that John saw. All men have a right to their opinions, but to adopt them for rules of faith and worship, is wrong, and may finally leave the souls of them that receive them for spiritual guides, in the telestial kingdom.” (Evening and Morning Star, Vol. 1, p. 69) The only ones that are lost forever are those that turn against the light of truth having once received it; and delight in living by their own will. Man has always had a proclivity to live by his own will in rebellion to those of God. Man soon divided in the days of Adam. Noah preached the gospel to those in his generation for one hundred and twenty years; but, was only able to save himself and seven others of his immediate family. Man again divided after the great deluge. Only those who followed the will of God through Noah, Abraham, and his seed had the great opportunity to be resurrected into the celestial glory. Authority from God was lost for the 400 years that Israel was captive in Egypt. Moses restored the law; but, even before he returned from the mount, the people fell back into the evils of Egypt and worshipped a pagan god. They lost the opportunity to be priests and kings to the world; and were placed under an added temporal law until Jesus was ordained to the Melchisedec Priesthood. They rebelled again under Jesus; and declared “Crucify him, crucify him.” The gospel dispensation was then given to the gentiles. They fell back into the doctrines of paganism; and all authority from God was taken away for 1,260 years. 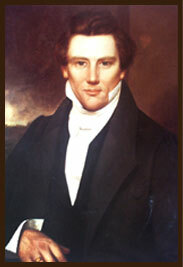 Divine authority and the gospel was restored by Joseph Smith; and continued through James J. Strang. Again, the people rebelled, James was taken, and the people were scattered. “28 Verily I say unto you, All sins shall be forgiven unto the sons of men, and blasphemies wherewith soever they shall blaspheme: 29 But he that shall blaspheme against the Holy Ghost hath never forgiveness, but is in danger of eternal damnation.” (Mark 3) HERE IS THE GREATEST DANGER OF ALL: the second death when some are disembodied and cast out with Satan and his followers to be ghosts for eternity. The time and nature of forgiveness depends on the person and the violation. None can be forgiven in this life or the next that remain in sin—transgression of the law of God. The most grievous sin is killing. None can be forgiven in life. King David had a man placed in the front lines of battle so he would be killed and David could have his wife. David lived about a thousand years before Jesus. After the resurrection of Jesus, when many of the saints were resurrected and walked the streets of Jerusalem, David was not to be seen. They checked his sepulcher; and David’s bones were still there. He had not yet been forgiven for killing. Adultery is a sin against man and society. Those who commit adultery must repent with all their heart to be forgiven. If they should commit this crime again, they cannot be forgiven in life. After death of the spirit of man is taken back to Jesus for judgment. “7 Then shall the dust return to the earth as it was: and the spirit shall return unto God who gave it.” (Eccl. 12) Members of the Kingdom of God who endured faithful and remained in obedience to God, have the promise of spending the time between death and the resurrection in the bosom of Abraham. All others are taken to the spirits in prison. “22 And ye shall be hated of all men for my name’s sake: but he that endureth to the end shall be saved.” (Matt.10) “7 He that overcometh shall inherit all things; and I will be his God, and he shall be my son. 8 But the fearful, and unbelieving, and the abominable, and murderers, and whoremongers, and sorcerers, and idolaters, and all liars, shall have their part in the lake which burneth with fire and brimstone: which is the second death.” (Rev. 21) The myth about a lake of fire and brimstone is found once again. These are taken to the spirits in prison. Those who either heard and gospel but did not obey it and those that received the gospel and turned against it will suffer grievous mental anguish. HELL is a myth most likely adopted from paganism. Only a very few enter the Kingdom of God in mortal life and have hope of the first resurrection. Most will be taken, after death, to the spirits in prison. Those who never learned the gospel of Christ will be offered the blessings of the Kingdom of God. The ones that never obey the gospel and remain filthy still will inherit the least in eternity. The gate into the Kingdom of God is still open. 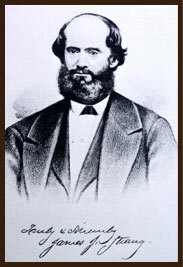 The prophet James J. Strang ordained L. D. Hickey one of the Twelve Apostles with authority to ordain all lower offices. Apostle Hickey ordained Samuel Martin a high priest, who ordained Lloyd Flanders a high priest. Bro. Lloyd ordained me an elder on July 8, 1956. You now have the wonderful opportunity to know God and obey the gospel. Before the great and terrible Day of the Lord, James J. Strang is to return and gather the worthy to a place of refuge.